Last week I had the pleasure of attending my first ENR Future Tech in San Francisco at the Grand Hyatt. The conference started on Tuesday May 30th and went through June 1st. This has always been an event on my radar but this year I was lucky enough to be accepted as a speaker so I made the trip across country to attend. Let me start by saying the ENR Future Tech is not for your average construction nerd, this is the event for the “Nerdiest” of the nerds in the construction tech space. Tom Sawyer (@tsabroad), Deputy Editor at ENR did a fantastic job at curating content for those that really wanted to know what was on the cutting edge in construction technology. The event was made up of keynotes and panel presentations that covered topics from Data and Analytics, IOT (Internet of Things), Machine Learning and Artificial Intelligence (AI/ML), and of course VR/AR. Overall it was a very well-rounded lineup that had something for everyone. In addition, there was a short list of vendors set up to give you the latest update on what they were developing and working on. I also ran into many vendors in the crowd who were there asking the same question I was, where are we going as an industry? When I left Future Tech I had several pages of notes and lots of insight into what the top 400 were doing to push the envelope. I had also had heard from industry leaders on what is on the horizon that we should be looking at next. Here are the some of the key takeaways that I left with. During the event I found myself at a mini launch event hosted by Dewalt (@DEWALTtough) and Procore (@ProcoreTech). Dewalt was launching their new Jobsite Wifi solution which we have all heard was in the works. In addition to this they were showcasing their new Construction IOT devices pushing us towards a connected job site. For any construction technologist we understand how huge job site connectivity is and having fast, stable and limitless data available throughout the job site is huge. Dewalt is trying to make that more of a reality so we can leverage more sensors and tracking devices on the job site for better analytics. If you didn’t see the launch video you can catch it here (https://www.procore.com/dewalt/) and there will be a follow up rebroadcast of the panel discussion featuring Taylor Cupp (@taylor_cupp) from Mortenson on June 28th, sign up here (http://www.enr.com/events/360-panel-discussion-the-smarter-jobsite). Mortenson has been piloting this technology on job sites and from conversations with Taylor, it really works and will be a game changer. If you hadn’t already guessed I was there to speak on a panel about data and analytics, shocker. What was intriguing to me was how the theme of data, its use and the analytics of it continued throughout the conference. 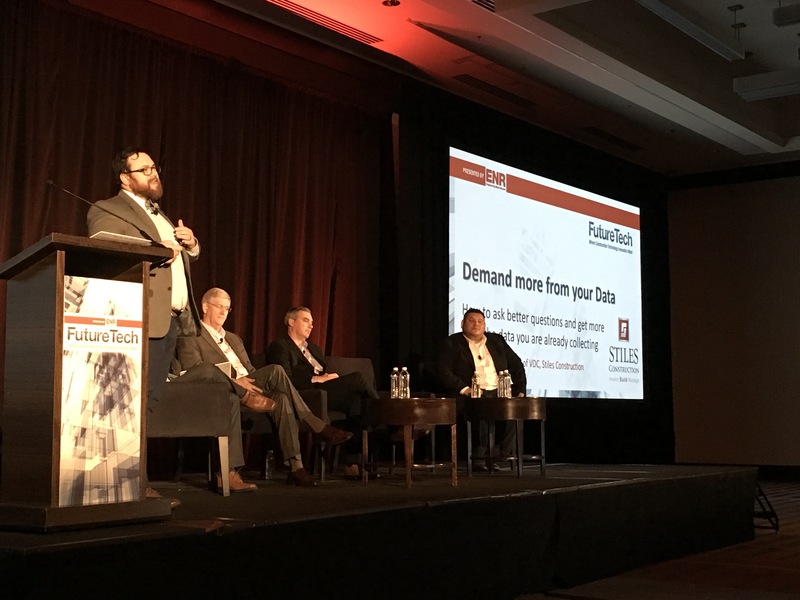 Almost all of the presenters talked about a more connected industry and the leveraging of data for better projects, better designs and improved productivity. We as an industry are collecting more data than we ever have, now we need to put it to use. There was an “after-party” at Rhumbix (@Rhumbix) to discuss this very topic on how to transform your organization into a data driven culture. The session was recorded and when it is posted I will edit this session to have a link. Not to overstate it but data is going to play a huge role in the future of our industry moving forward. There was another theme that seemed to span several presentations including Lance Hosey’s When Buildings Design Themselves. Lance spoke about how AI/ML would cause disruption in the AEC industry including how 88% of jobs in our industry could be replaced with automation. He also spoke about how we define Architecture as Art and how we could be missing an opportunity to solve complex design problems with that line of thinking. His line of thinking may have been very uncomfortable to architects and designers in the room as he challenged the notion that AI/ML could not create original creative works of art and showed examples of how it already had including a ‘New’ Rembrandt as discussed here. Design is not the only area that was discussed to be impacted by AI/ML, companies like Skanska (@skanskausa) talked about the use of Smartvid.io (@smartvidio) to analyze photos and videos for safety risks. Essentially creating limitless sets of eyes on a jobsite to keep workers safe during their daily tasks. It is without a doubt that automation via AI/ML is already affecting our industry and as the technology becomes more widely deployed and can access more of the data we have available it will only become more powerful and mainstream. During David J Wilson’s keynote Fail Safe, Fail Fast, Fail Forward, he challenged us to think outside the box and spoke about how Bechtel (@Bechtel) had set aside over $60M dollars to spur innovation in their company and the industry. David’s presentation focused on taking an agile approach to innovation and crowdsourcing ideas that could then be funded by the innovation fund. One of the things that stuck with me as I am guilty of it, he showed a blank slide where the Construction Productivity graph that we all know and love should have been. David took a stand and said “I am no longer going to show this graph until we change it”. It was bold but it is what we all needed to hear. We need to focus on changing the future rather than what has happened in the past. In all it was an amazing experience to be at Future Tech with so many leaders. I highly suggest attending next year if you want to be challenged in what you are doing as part of your construction technology implementation. I want to give a round of applause to Tom Sawyer all of the team at ENR for putting on such a great event.